Piewesta Peak is a fun and challenging trail, but its appeal is damped by the large crowds that regularly flock to it. It is the most popular trail in Phoenix and with good reason. 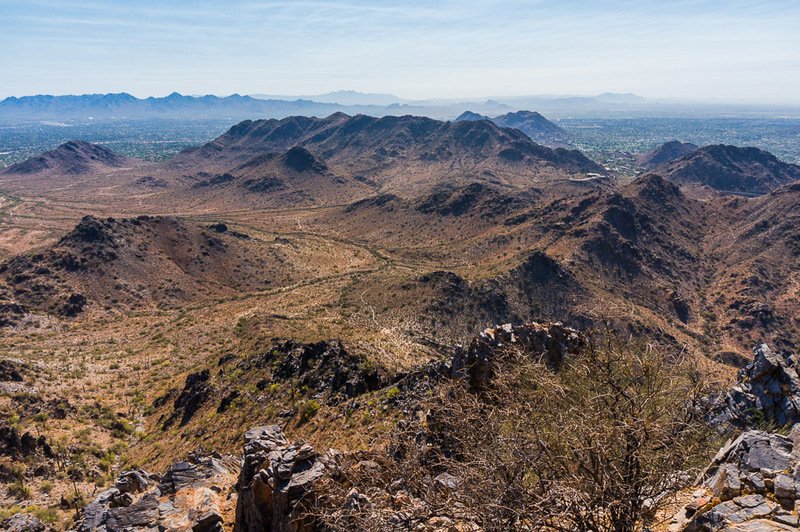 It offers a strenuous, but short hike that lets you get in a good workout while taking in impressive views of the surroundings from one the taller peaks in Phoenix. It is not a trail for the faint of heart. It is a steep, uneven trail that requires scrambling near the top. If you push yourself, you can get a great workout, but it is still quite do-able for the less physically fit if you take it slow and rest frequently. The summit is a rocky outcropping where those who make it to the top bask in their achievement. It’s a good place to rest and wander a around a bit while enjoying a vista that takes in nearly all of Phoenix Mountain Preserve from Dreamy Draw to Tatum Boulevard. And if you just can’t bare to carry the food you brought up back down, the mountain squires will be happy to take off you hands. Don’t get caught out in the mid day sun during the hotter months. Plan on hiking it in the early morning or during the cooler months. The parking area at the trailhead is very crowded during “rush hour” and is often overflowing with incoming cars backing up out of the driveway. There is water (with bees hovering around it) but no toilet at this trailhead lot. There are many other parking areas along Squaw Peak Drive with better facilities like toilets and extensive ramadas. There is a constant stream of people coming and going so if you really must park right at the trailhead, you can get in after a bit of a wait. But why bother? Driving up a little ways offers more parking and more (and less crowded) trails. Between the impenetrable terrain and flood of hikers, only a moron would try to ride this trail. Also, it is officially off limits to everyone but hikers. This entry was posted in Difficult, Great Hiking Trails, Hiking Trails. Bookmark the permalink.